Looks Good from the Back: Buy This (But Not Full Price Like I Did): J Crew Downtown Field Jacket. 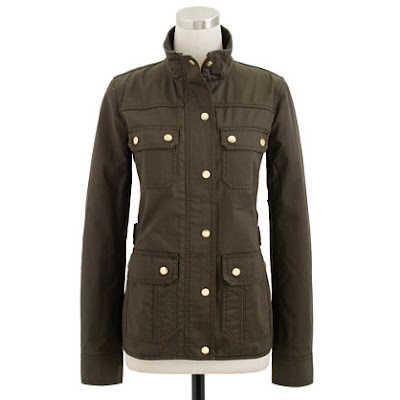 Buy This (But Not Full Price Like I Did): J Crew Downtown Field Jacket. I really can't say enough good things about this jacket. It's casual but the shiny brass snaps keep it looking sharp and it's the perfect in-between layer for fall. Just go for it and thank me later. It fits true-to-size. Get the medium if you're going to wear it just over a shirt, large if you want to layer it over a sweater. Oops, thanks! I fixed it. A bazillion eons ago in college, I had an earlier version of that. I wore it forever. I've seen it in the stores and love everything about it. Just bought my navy version via eBay. Lurve it!